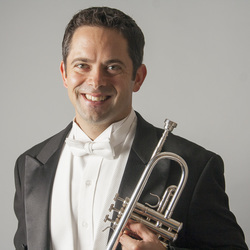 Anthony Prisk joined the Philadelphia Orchestra as Second Trumpet in August of 2013 and held the same position in the Houston Symphony for 11 years prior. He had a coveted fellowship with the New World Symphony from 1998 to 2002 where he played solo with the orchestra and studied with many of the top orchestral trumpet players in the country including David Bilger, Michael Sachs and Charlie Geyer. Before attending the fellowship, Mr. Prisk completed a master’s degree from McGill University studying with Paul Merkelo in the Orchestral Studies program. During his time in Montreal, he won several ITG solo and orchestral competitions and took second prize at the National Trumpet Competition. He received his B.M. from the University of Illinois where he studied with Ray Sasaki. Mr. Prisk has performed with many orchestras including the Los Angeles Philharmonic, Boston Symphony, Grant Park Music Festival Orchestra, Moscow Philharmonic and more. He is dedicated to teaching activities on the faculty of Temple University and has taught at schools all over the US including The Curtis Institute, University of Texas, Baylor University, Bowling Green University, Iowa State University, and Rice University. Mr. Prisk also serves on the education committee of the Philadelphia Orchestra and is dedicated to community outreach.